1.The migratory behavior and pathways of meadow moth, Loxostege sticticalis in China. 2.The symbiosis between entomopathogenic nematodes and their bacteria. 3.Reproductive manipulation of Wolbachia to its hosts. 4.Seasonal dynamics of structure and diversity of insect communities in wheat fields. 5.Dynamic analysis of distribution patterns of the spiders in a cotton field by pitfall traps. 6.Assortment and characteristics of tobacco insect communities in China. 7.Community structure of leaf rollers in longan orchard and litchi orchard. 8.Influence of temperature on development and survival of Pristiphora sinensis and control effect of some insecticides. 9.Electroantennogram responses of Carcelia matsukarehae to the volatiles of Pinus massoniana damaged by Dendrolimus punctatus. 10.Olfactory behavioral responses of Tetrastichus sp. To liposoluble components from secretion of Paratrioza sinica. 11.Suppressive effect of azadirachtin on litchi fruit borer (Conopomorpha sinensis) population. 12.Dynamics of phenoloxidase activity in haemolymph of Helicoverpa armigera at different stages and instars. 13.Effect of tobacco varieties on the activity of carboxylesterase and glutothinetransferase in Myzus persicae. 14.Properties of esterase from different instars of Oxya chinensis nymphs. 15.Functional responses of Chrysopa sinica, Propylaea japonica and Leis axyridis to Bemisia tabaci. 16.The morphology and fine structure of the compound eye of Propylea japonica. 17.Behaviors of the hangingfly Bittacus planus. 18.Bionomics of Megachile (Chalicodoma) desertorum. 19.Random amplified polymorphic DNA analysis of three chironomid species. 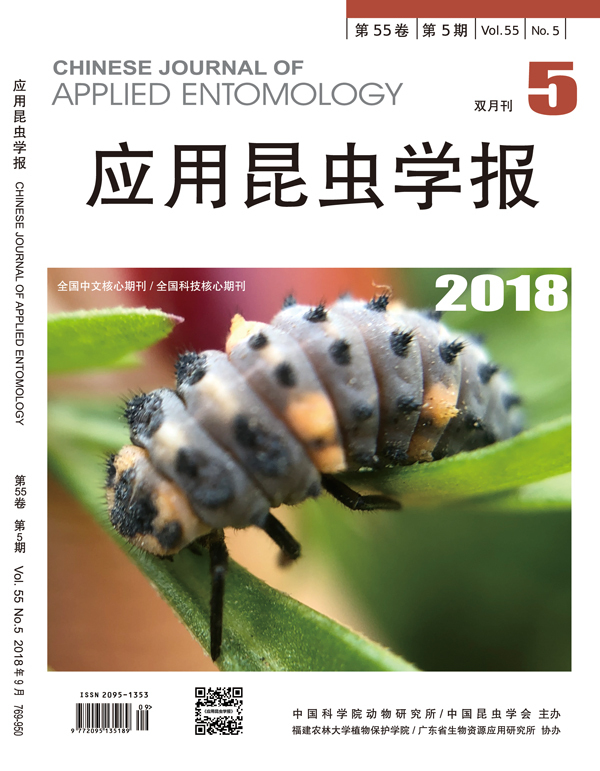 20.Urban sting wasp species and occurrence tendency analysis in Hangzhou. 21.Potential risk assessment of a new invasive pest, Quadrastichus erythrinae, to the mainland of China. 22.First discovery of Wolbachia infection of Bactrocera （Zeugodacus） taufrom China. 23.Microsatellite markers for genetic polymorphism in four geographic populations of the oriental fruit fly,Bactrocera dorsalis. 24.Supercritical CO2 fluid extraction of bioactive components from Eupolyphaga sinensis and its efficacy. 25.Influence of temperature on the growth of over wintering Eupolyphaga sinensis. 27.The effect of rearing densities on growth and development of larvae ofPalembus dermestoides. 28.Generational partition of diamond back moth,Plutella xylostella. 29.Occurrence regularity and control threshold of Aphis glycines in fresh soybean fields. 30.Five narrowly distributed species of Silvanidae from Yangzhou captured in wet blue leather and packages. 31.Bionomics of Bambusaspis miliaris on the bamboo Dendrocalamopsis oldhami. 32.Construction of the cDNA library of Spodoptera exigua. 33.A method for rearing woolly apple aphid using Malus prunifolia seedlings. 34.Forecasting quality assessment methods of the occurrence degree of plant diseases and insect pests. 35.Calculatiang the LC50 of insecticides with software SPSS. 36.Chinese names of “Lucanidae” and genera from China. 37.Precaution of an alien coconut palm pest, Homalinotus coriaceus. 38.Precaution of an alien pest, Arhopalus tristis. 39.Developmental threhold temperature and the effective accumulated temperature of Musca domestica. 40.A preliminury observation of the aberrant forms of Graphium sarpedon in China.